We're at home in Alaska. The transition has been immediate but not difficult. 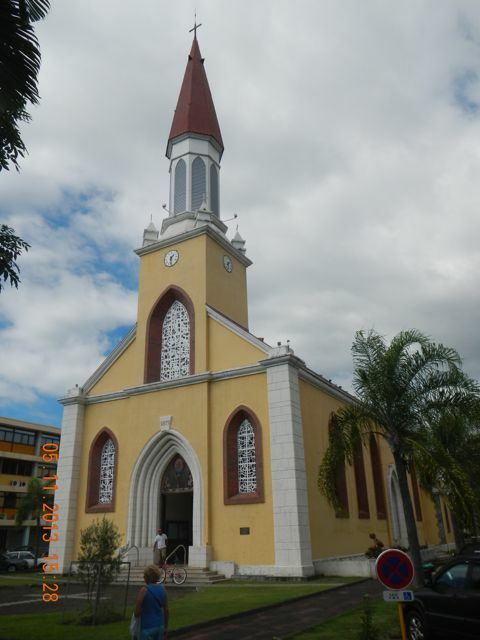 As we continue to ruminate on our voyage and its implication for us, we came across some nice photos that we'd like to post. Tom introduced us to the Cruise RO Desalinator/Water Maker. 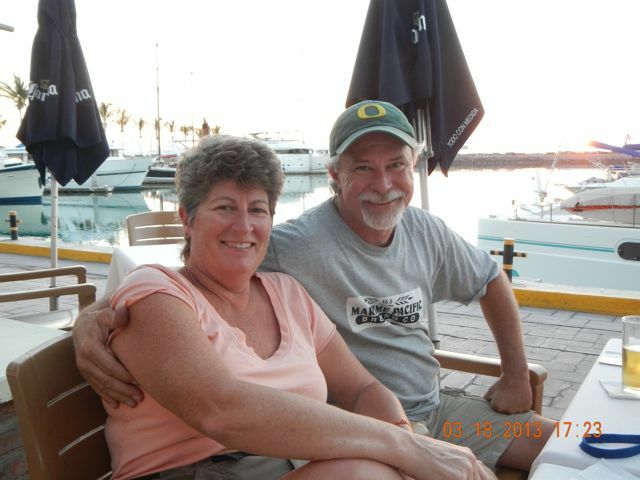 Tom and Jeanne became our friends and we'll visit them in La Paz when we're in Mexico. Great folks! 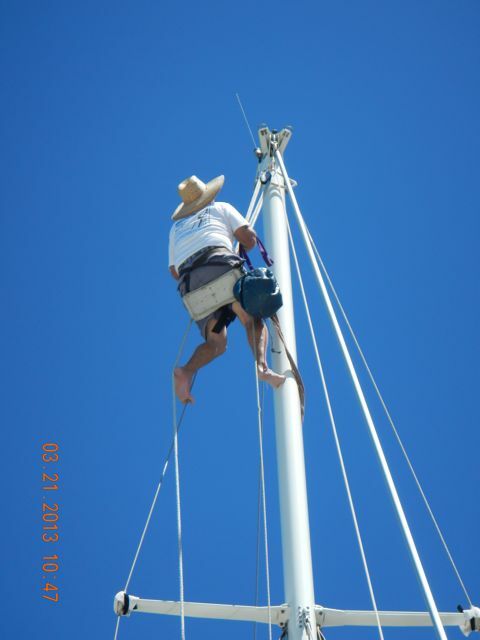 Jeffrey from Dawn Rigging, La Paz, hoists himself up the mast to help install a new wind speed/direction transducer. First Brine! Brine is the extra-salty water that is the by-product of desalination. 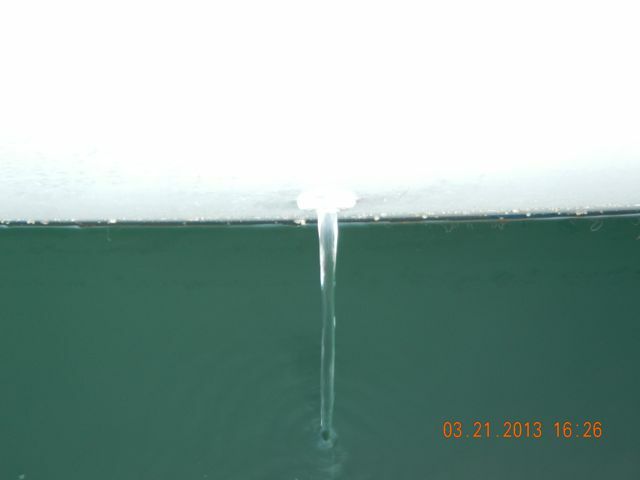 This is a photo of the brine being expelled from our new through-hull. Chip, as usual, reading while on watch. 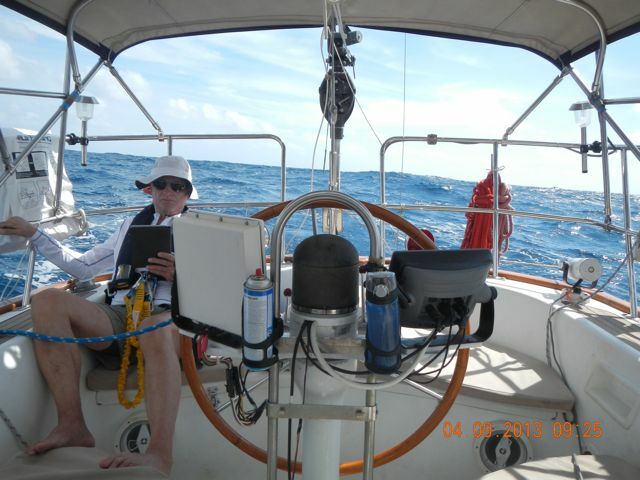 The Hydrovane was steering, there were no vessels for hundreds of miles around, so why not? The small device on the black gimballed stand at right is the generator for the towed generator. The towed line you can see pulls a small propeller through the water and that spin is converted into electricity that helps recharge our batteries. We "make water"as it's called. 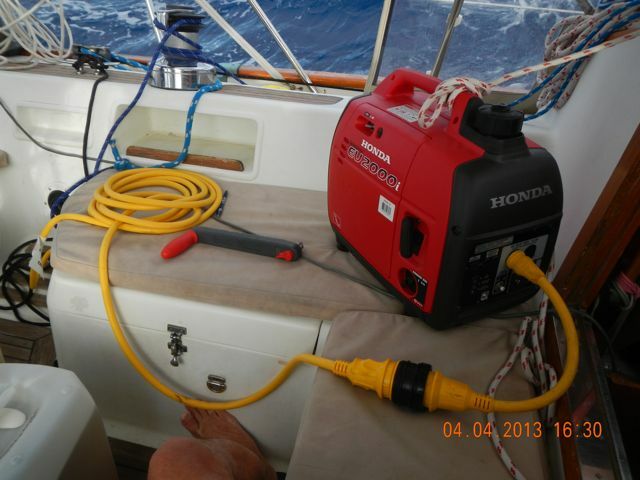 The Honda output is connected to the shorepower inlet connection. We power the water maker and can charge batteries on electronics. 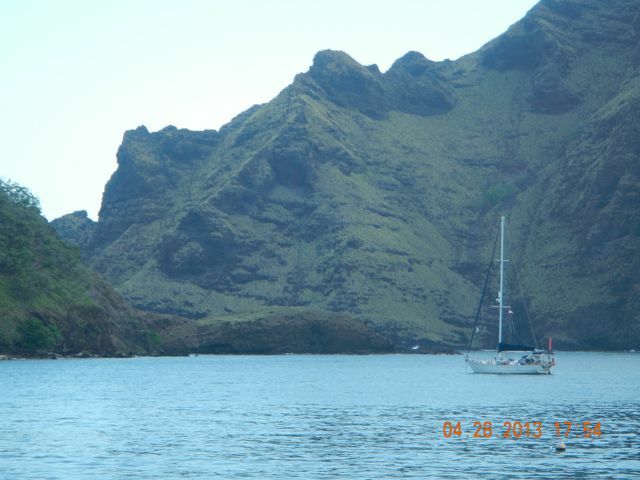 Daniel's and Antoinette's Bay, with Wings lying to her anchor. Her red Hydrovane stands out clearly on her stern. 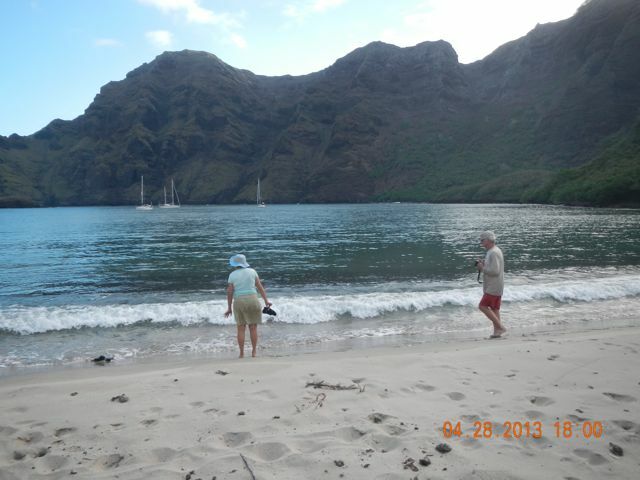 Conni and Chip ogle the black-tipped sharks that make their way to the shallows along the shore. Only 3-5 feet long, they feed on anything that's smaller than they and unlucky enough to wander into the surf. In the background, Wings has been joined by three other boats. 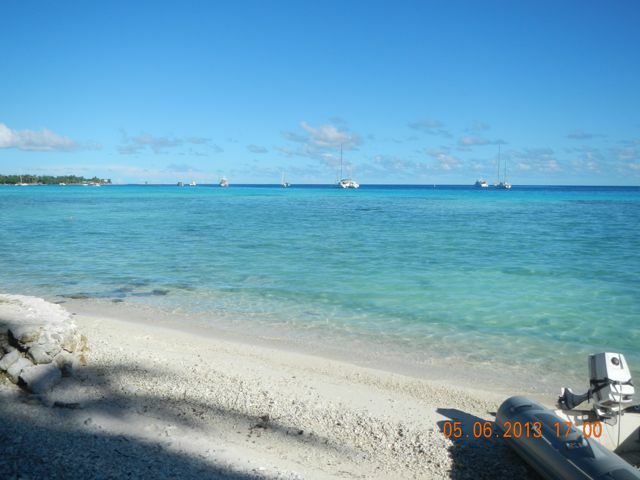 Chez Lili's on Rangiroa. Not a bad view! Tihei shows us around the Gauguin Pearl facility. This craftsman is at the top of the field and has been given the responsibility of placing seeds into pearls that have already proved themselves able to produce high quality pearls. These oysters will be seeded a total of 4 times, if they continue to produce. 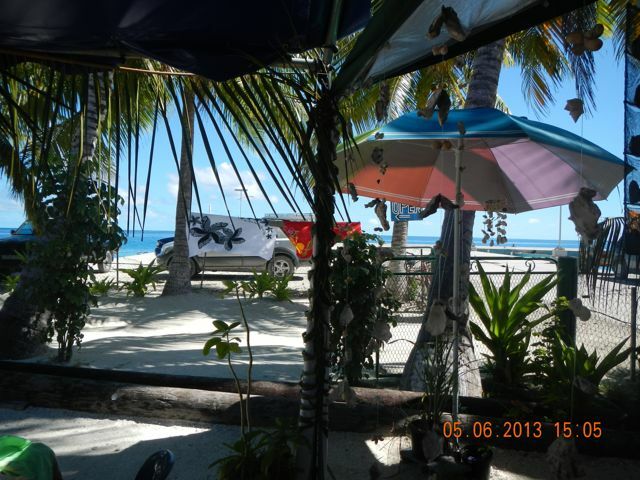 Our chariot awaits to haul us back to Wings after a stay on Rangiroa. 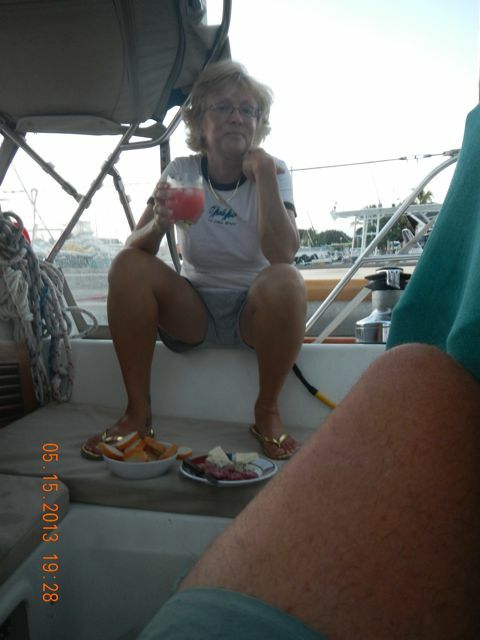 Cocktail hour on Wings as we enjoy the weather in Papeete. 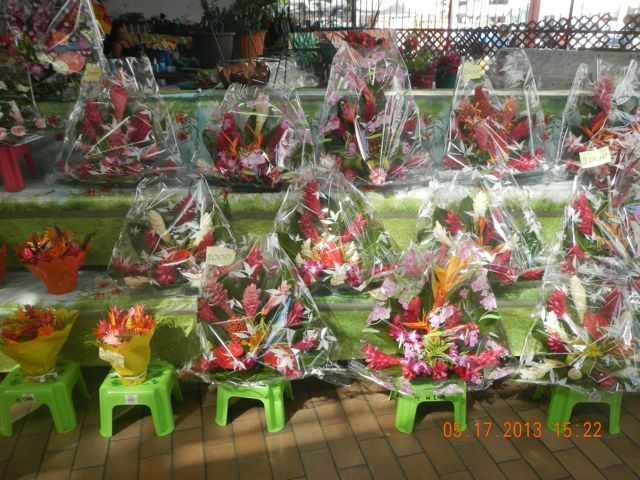 Flowers for which we'd pay a premium are available for pennies in the fresh flower market, Papeete. 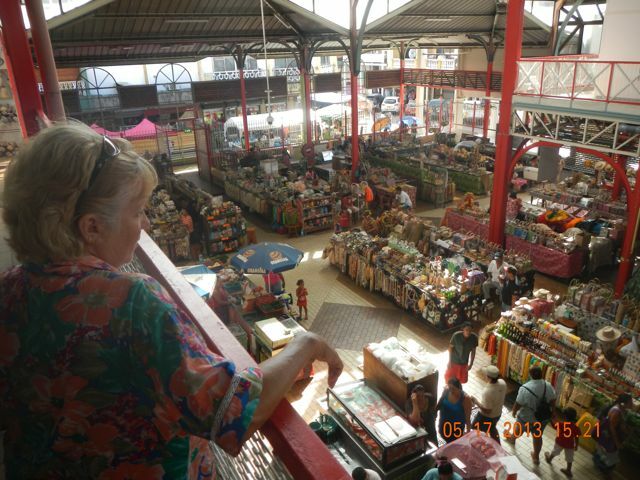 The tourist end of the market is filled with color and movement. Lovely Conni looks on. 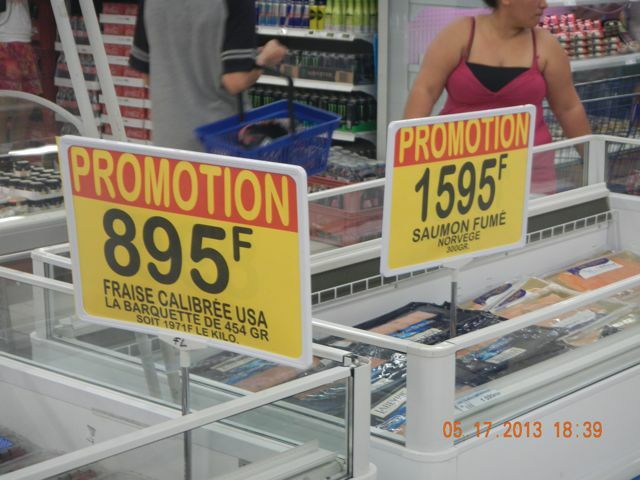 Fresh strawberries from the US and smoked salmon from Norway are both available in the Carrefore near the marina in Papeete. 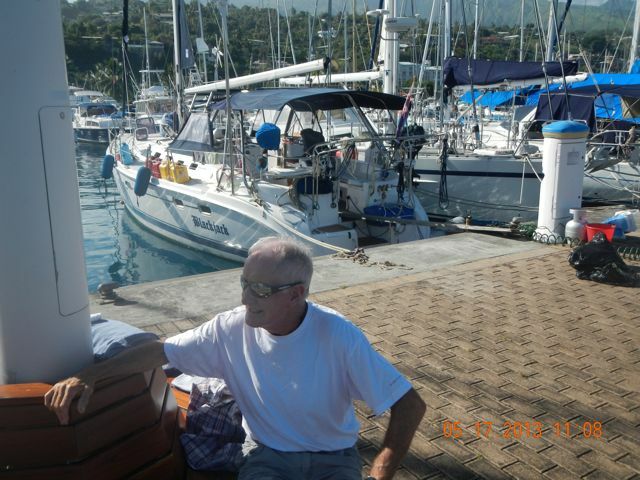 Our friend John sits in front of his boat, Blackjack. 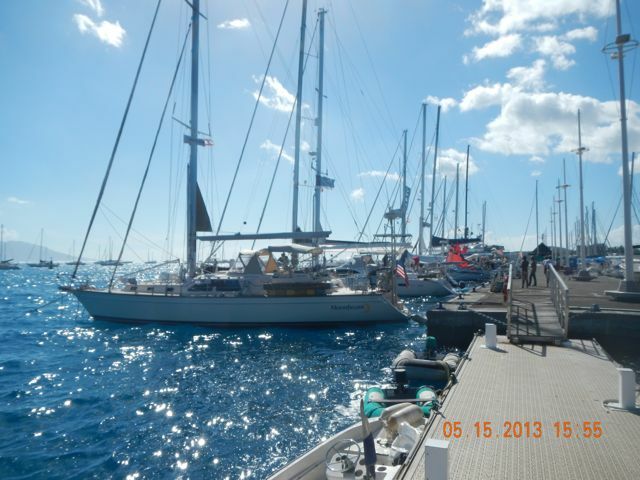 Med mooring: drop your anchor out a way, then back toward the dock. 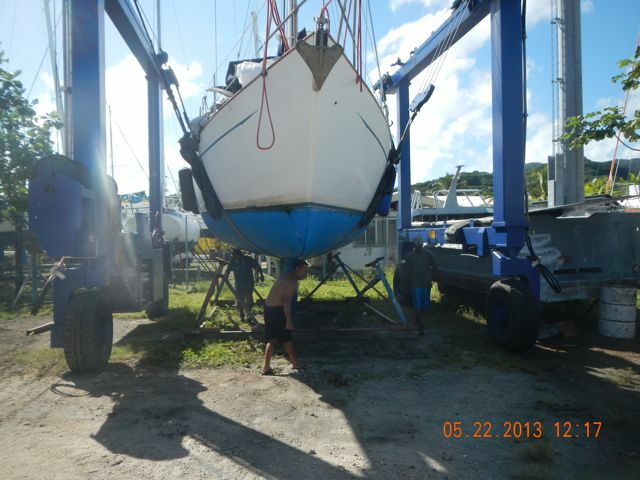 Tie off and use a plank to reach the dock from the boat's stern. 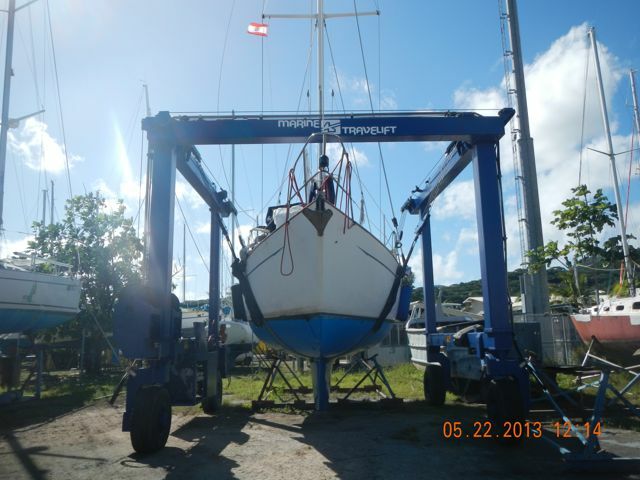 It's a cheap and easy way to stack a lot of boats, but they tend to jostle each other a lot and one must deal with somehow climbing around various items at one's stern. 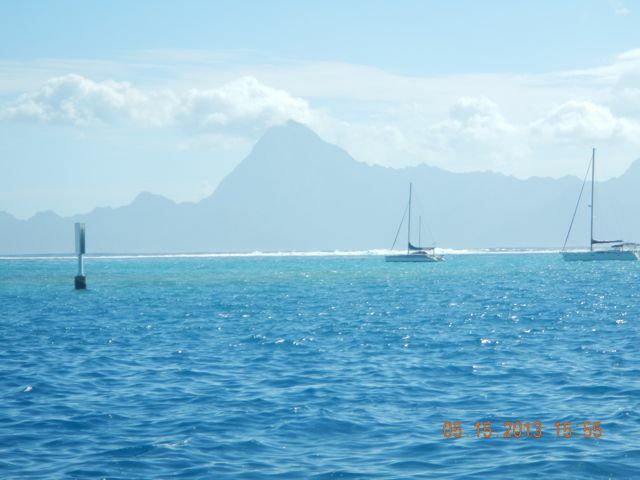 Moorea and the enormous surf are visible and audible from the marina in Papeete. 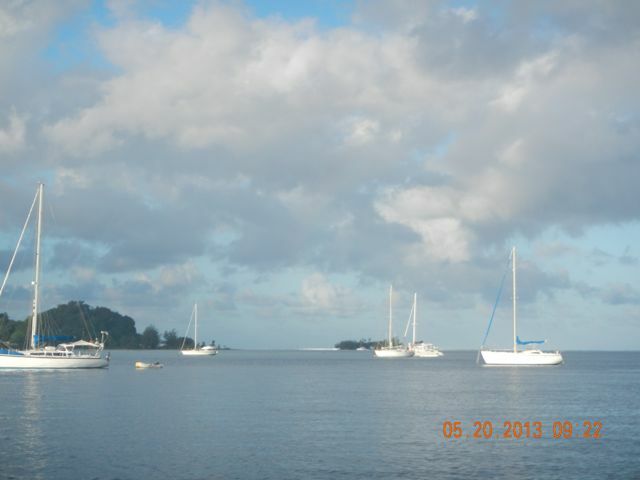 Tranquility in Raiatea. We're in a mooring field with a lot of other boats. 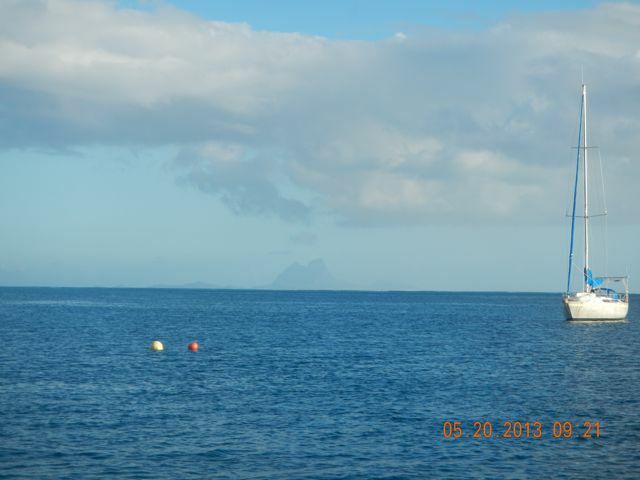 Bora Bora visible from astern of us. A unused mooring lies between. Poised above her cradle, Wings starts her rest. The TraveLift will slowly lower her to the cradle. The cradle is a single unit so provides excellent support that's not likely to be disturbed or become unstable like individual stands. 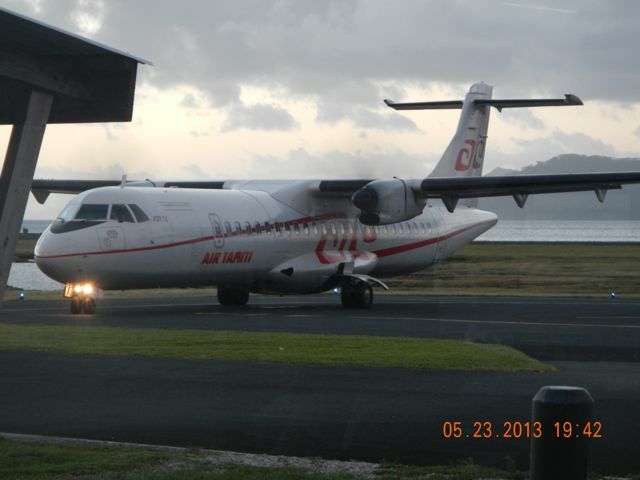 Air Tahiti plane that took us from Raiatea to Papeete. It's a VERY short strip here! One of the many decorative motifs in the airport. I'll interpret, top to bottom. Sky above wavy hair. There's a furrowed brow above a stern face with pursed lips. Right hand is up with all 5 fingers pointing upward while the left is held horizontally with the thumb upward. Legs extended below. And, it's a male figure..... Couldn't do this in the US!